Planar shock waves in single-crystal copper were simulated using nonequilibrium molecular dynamics with a realistic embedded atom potential. The simulation results are in good agreement with new experimental data presented here, for the Hugoniot of single-crystal copper along 100. Simulations were performed for Hugoniot pressures in the range 2 GPa 800 GPa, up to well above the shock induced melting transition. Large anisotropies are found for shock propagation along 100, 110, and 111, with quantitative differences from pair potentials results. 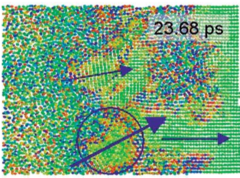 Plastic deformation starts at Up0.75 km/s, and melting occurs between 200 and 220 GPa, in agreement with the experimental melting pressure of polycrystalline copper. 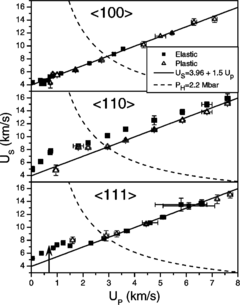 The Voigt and Reuss averages of our simulated Hugoniot do not compare well below melting with the experimental Hugoniot of polycrystalline copper. This is possibly due to experimental targets with preferential texturing and/or a much lower Hugoniot elastic limit.